Clematis 'Westerplatte' is an early-flowering clematis, producing large red flowers in late spring and early summer, with a second flush in early autumn. A compact plant, it can be grown in a container, and suits gardens where space is limited. Best on a sunny or partially shaded wall, not suitable for north-facing walls. 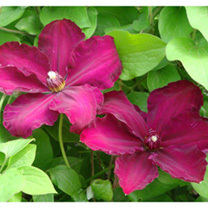 Clematis 'Westerplatte' is in pruning group 2. Height 150-200cm. Supplied in a 2-3 litre pot.